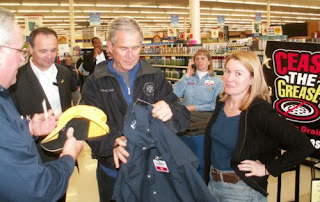 He's still wearing a Presidential Seal jacket even on a visit to a hardware store? Sheesh. Just imagine if he took them up on the job. He couldn't even locate the "weapons of mass construction." Had an interesting and nearly blog-free week. Downside was having several computer malfunction issues, diving into the complex task of choosing Lord Running Boy's school, and being me. Upside was personal breakthrough. More later. Yeah, but he'd do just fine in the screw department. - just how do you justify paying your vet bill but not a hospital bill? are you any different from the typical "indigent" who pays their cell phone and cable/dish and buys lots of garbage food but expects charity or a certain level of care from the hospitals? - on healthcare - if you work in the industry, you get treated better. I know this from experience. You then also would know that hospitals use a metric that every $3500 provides a charity care. I bring this up because it's sort of disgusting you can justify not paying (or maybe you did by now about that amount) a NYC hospital bill. Oh, and, you were in NYC - if you want decent/attentive healthcare - a) go to a Catholic hospital b) get out of crazy big cities but don't go too small - someplace like Medford or Missoula might be okay - but you also hafta cross ref your migrant/immigrant population, union worker(s), and service lines/specialists if you have cancer or certain chronic conditions c) pay cash and get a discount d)expect better care for your pets -- they treat physicians/staff better than most patients and patient families. Hmm... I guess that's it... I'll just keep doing what I do and am grateful that I do have a job, decent health, and critical thinking skills with a dash of resourceful to survive the cratering of the global economy. re that picture: just like for the last eight years, Bush looks like a delusional idiot who thinks he's President, and everybody just smiles nervously around him and decides it best not to make a big deal out of his weird habit. oh, and "hey Brother Tim, good to see you!" oh yes we're all too familiar, brother. Welcome and thanks for commenting! I'll respond as best as possible tho I'm my recall isn't perfect on each post you're referring to. --we will not be putting our kid(s) in a regular public school. This system does have alternative schools that are pretty far off the farm but get public funding. Then typically the parents raise money for multi-year mixed-aged classes, exploration and project-based learning that require fairly high degrees of parent, intern, class assistant involvement. It's that or private. --the vet bill is out of pocket. The hospital bills are over and above what the best available private insurance plan would pay for. In one case a hospital was guilty of committing fraud (charging 3 residents checking a chart in 90 seconds out as 20-minute head surgeon visits for $700 a pop). In another there was a loophole in a COBRA plan which would not pay a surgeon who performed an appendectomy. Someone in the system has to take responsibility for that; I paid $1400+ per month to be insured in good faith and feel it should not be me based upon some weird policy wrinkle disallowing a non-staff surgeon to operate on an emergency. A decision I had no input on or knowledge of whatsoever. --thanks for your general health care tips. In the NYC at the time however it was a limb and life threatening emergency on a weekend. Rapidly spreading blood poisoning from night-before dog bite on forearm. There is no good way to contest upcharging or upcoding and if you're the patient it gets pushed onto you. I find intentional fraud disgusting and will not pay for it. Neither did the insurance company want to. Why should I have paid what I knew was an outright lie? As for charity, I already give well over $3,500 a year and would like to keep it that way. The dog bite hospital got about 80% of their total laughably high bill paid. They charged $8000 for an IV drip of antibiotics and a bed with no blankets or sheets. My wife gave birth for about that at a smaller-town hospital outside a large city as you describe. This system is busted and the hospitals, insurance companies and doctors are all gaming each other. A competent and caring vet compares quite favorably. the world has been asking for 8 years, "Is this guy for real?" No. He's not. I watched Obama run the Senators at the fiscal responsibility summit yesterday and it was a thing of beauty. He's for real. It was like a professor leading a law class in front of a bunch of smartasses he's seen before and just effortlessly going kung fu on them. McCain started off with the Marine One Price Scandal. Obama was prepped, said two sentences and when he was done McCain had sat back down and from the look on his face it quite literally appeared that he had been kicked in the balls and everybody in the room except McCain had belly laughed. No matter what happens, this guy is my leader. Eisenhower is the only President I can think of with leadership abilities as high. "Upside was personal breakthrough. More later."